Another overly dramatic entrance for the 16 new survivors highlighted by Jeff Probst yelling over the din of the helicopter is capped off with the unexpected twist that Boston Rob and Russell would be joining each of the tribes this season. Jeff didn’t let the tribes leave without revealing another twist. Those who were voted off would not be completely out of the game. They’d be sent to Redemption Island and would have a chance to compete their way back in to the game for another chance. Both tribes seem equally excited and nervous at the presence of the two famous Survivor combatants on their tribe. Each is known for his high level of play and cunning ability to manipulate players. This could work to their favor during challenges or if they’re on Rob or Russell’s side or could lead to a quick exit from the game. Russell wastes no time going back to the same strategy that got him to two consecutive final tribal councils. He seeks out a young, attractive female and earns her trust to give him power and leverage in the tribe. Stephanie is nervous of Russell but welcomes the challenge of trying to be his lackey while remaining cunning enough to know when it’s time to get rid of him. For Rob, his style has changed from his days on Survivor: Marquesas and he obtains his power through leadership rather than intimidation. His tribe is psyched to have such a skilled survivor and competitor with them to lead the tribe and he quickly gets along with most of his tribe. His wits have not been dulled, however, and he takes noticed of and tries to remain friendly with Kristina after catching her looking for a clue to a hidden immunity idol. The first immunity challenge is a test of strength, coordination and puzzle solving that requires all teammates to participate. The tribes must push heavy sections of stairs in place to get to the second section which requires one member chop through ropes until a second set of stairs is released. Finally the tribes had to put together a large block puzzle to win the challenge. Russell’s tribe, Zapatera, gets out to a huge lead and hangs on despite a hard charging Ometepe tribe backed by Rob’s superior puzzle solving skills. Back at camp, Kristina reveals to Francesca that she found the hidden immunity idol, even without a clue. 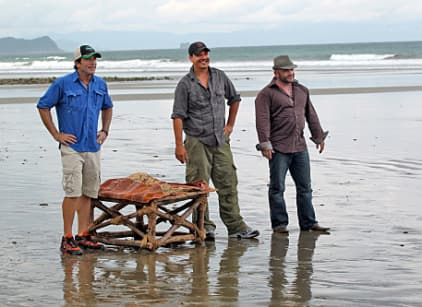 Along with Phillip, the trio want to use the idol to blind side Boston Rob and his alliance of six. However, in order to get Phillip’s vote, Kristina needs to show Phillip the idol, a move that backfires at tribal council when Phillip spills the beans that Kristina found the idol. Boston Rob demands she show him the idol and presents her with an offer to give him the idol and remain safe. She declines his offer and Francesca is sent to Redemption Island instead, but fears her days on Ometepe may be numbered, even with the idol.